STAR CITY, IN. 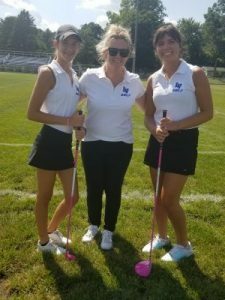 – The LaVille Girls Golf team opened the season at Pond View Golf Club against a 7-team field in the Caston Invitational. Taylor Garrett carded an 18-hole score of 133, while Elizabeth Howard was just two shots behind with a 135. “It was the first match of the season and we needed to get a few new season jitters out,” said LaVille coach Lindsay Garrett. “We started off slow but ended up playing really well. The Lancers could use a couple more girl’s to make a full team. Any girl in grades 9 – 12 interested, please contact Mr. Shearer in the LaVille Athletic Office – 574.784.3151 ext. 3039. LaVille will travel to the Round Barn Golf Club in Rochester for a Aug. 13 match against Tippecanoe Valley.